Let us take your little one and their friends on a truly magical birthday adventure! Our children’s birthday parties are suitable for 3 to 5 year olds, but younger and older guest are still welcome to join in - even grandparents can’t resist! It is a very exciting time planning your little one’s birthday party. You will be wanting everybody to have a lovely time – little ones, big ones and of course the adults too! This can be difficult to achieve sometimes if the party is themed or age appropriate only, as it will then limit the amount of participation from your party guests. For example, if you have organised a fairy party and there are cousins coming that are boys, they may not want to be seen dancing around like mystical creatures! If a party is age appropriate only and we were only to bring props and games for toddlers, older children will not be interested and probably end up running around and making it difficult for an entertainer to hold the interest of the other children. So, we’ll do everything we can to make sure that our children’s birthday parties can be enjoyed by EVERYONE! 1. Our first game is a special game for our birthday boy or girl. An experience loved by all, it helps make them feel extra special and relaxes their guests into the party. 45 minutes of fun starts with our Hello song with Louie the Frog. 2. With the help of our amazing puppets, props & games our adventure starts! From the moment we march up the hill to reach the castle, to the time we start waiting for our bus to go to the seaside, the children in the party will be engaged and very excited to be a part of such an amazing party. This first part of this wonderful adventure will last for 45 minutes. 3. Then, we’ll break for a well-deserved lunch and birthday cake (supplied by yourself). This is a good time to have the birthday cake, as we’ll give you time to cut it and pop it into the party bags or have as a dessert. We will be happy to bring the children together for this at the end of their party lunch before we restart our adventure. 4. 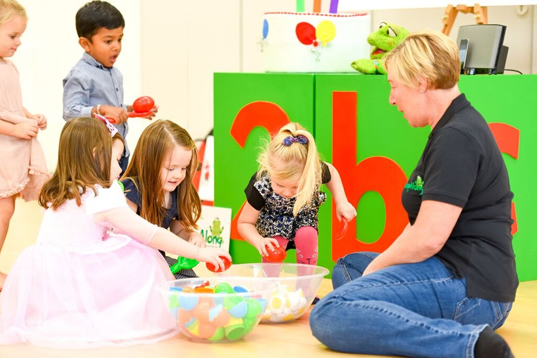 The fun and games will continue for a further 45 minutes, allowing you time to clear up and come and enjoy some time with your child on their special day. 5. Our Parachute Game ends the party with balloons for the children to take home. 6. 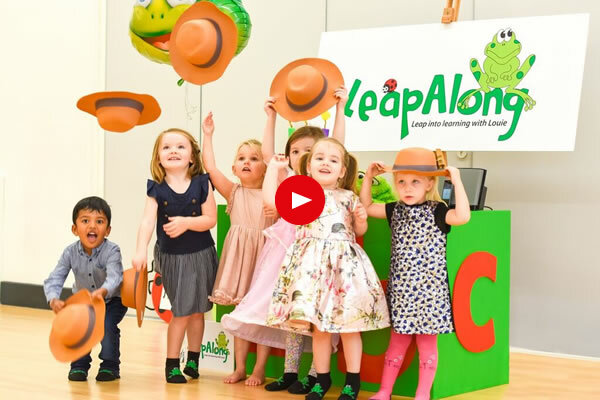 The birthday child will receive a very special gift from Louie to help them remember their special birthday party with LeapAlong. 7. It’s time to hand out your party bags and say goodbye to your very happy and tired guests (and their parents!). We have lots of tips for party food/party bags which we will be happy to discuss once you have booked your child’s party with us. We also can recommend some great halls that are clean and roomy and have large safe parking areas. Please note that we require a fairly large space for the children to move around and have a lovely time, so you’ll need to bear this in mind when choosing the right venue for your children’s birthday party!